Austin College has been a hub of activity in North Texas since the institution moved from Huntsville to Sherman in 1876. In the 138 years since, many connections have been built in the local community, but none more ambitious than the new Center for Community and Regional Development (CCRD) that will launch in Fall Term 2014. (1) How does the community become an asset to the College and its students? iiiiiThat is, how do the College and the community build relationships that provide students with exceptional learning opportunities? (2) How can a liberal arts college and its students be an asset to the community? iiiiiThat is, how do the College and the community build relationships that help make this a better place to live and work? The City of Sherman’s master plan has plenty of good ideas for park development, but funds for new projects are limited. 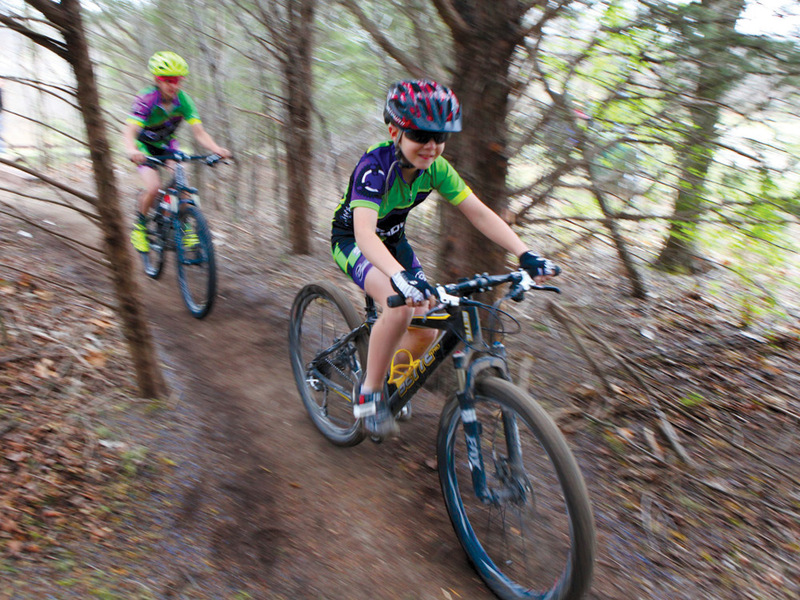 The wish list included a mountain bike trail—a labor-intensive endeavor that seemed unlikely to become reality. A fortuitous conversation on the sidelines of a soccer field changed that. Soccer dads Don Rodgers, director of the Austin College Center for Community and Regional Development, and Jason Griffin, local bike enthusiast, talked one Saturday morning about the possibility of a volunteer-built bike trail. Sherman Mayor Cary Wacker, also an Austin College staff member and a cyclist, is a champion for volunteer-driven projects to improve the community. It wasn’t long before the mayor and city staff met with Rodgers and Griffin to map the strategy for building a trail network through undeveloped forest land connecting three city parks. 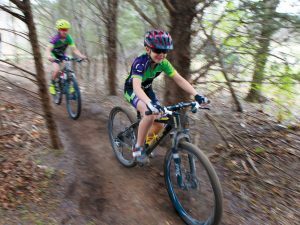 Chase Griffin, son of bike trail designer Jason Griffin, races through the trees on Sherman’s new Binkley Park Bike Trail. Currently at 2.5 miles, the trail network will grow to nearly eight miles and link three city parks. 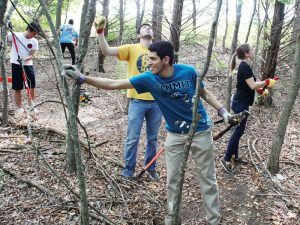 Austin College students volunteered hundreds of hours to complete the first phase. The CCRD will expand and deepen engagement of Austin College students, faculty, and staff in improving the quality of life in the Texoma region. Projects can be aligned with existing agencies, local governments, businesses, and residents to assist in planning and implementing a variety of community development projects. Don Rodgers, associate professor of political science, will head the new center; Rodgers has been coordinating community-focused activities for the past few years, and said the new structure as a formal program will provide a stronger platform from which to engage the community. A primary function of the center will be to collect data relevant to regional economic, social, and educational initiatives. The formation will be made available to regional organizations; the center also will organize meetings, seminars, and symposia focused on data collection and analysis. Those efforts have started quickly: in June, the College hosted the region’s first mental health conference, sponsored by the Texoma Health Foundation and celebrating the launch of the Meadows Mental Health Policy Institute for Texas.